FOR IMMEDIATE RELEASE: Portland, Maine (June 17, 2018) – New England Fights (NEF) made its return to Portland, Maine on Saturday night with the fight promotion’s latest mixed-martial-arts event, “NEF 34: Home of the Brave.” A jam-packed house of fight fans took in the action as NEF fighters delivered the non-stop excitement from bell to bell in what many are calling one of the best events the company has ever produced. On a card featuring a total of 18 fights, the judges’ scorecards were not needed until the thirteenth bout of the evening. Prior to that time, the early card featured a plethora of exciting finishes including a pair of D’Arce Chokes courtesy of Angelo Rizzitello (2-1) and Henry Clark (4-4) and highlight-reel knockouts by Cody Rolling (5-5) and Zac Lawrence (1-0). Thirteen of the evening’s fights ended in the first round. Kam Arnold (4-0) and Killian Murphy (1-1) waged an absolute war for the vacant amateur bantamweight title in what made history as the first amateur fight in Maine to ever go beyond the old three-round limit. Arnold claimed the title with a fourth-round knockout in a bout that will certainly be a contender for “Fight of the Year” this December when voting begins. Not to be outdone, Carlton Charles (2-2) and Duncan “The Highlander” Smith (3-2) took their amateur welterweight title fight into the fourth round as well. Smith took the gold home after putting Charles out with a rear-naked choke. On the professional side of the card, Young’s MMA teammates “The” Ryan Sanders (16-9) and Aaron “Relentless” Lacey (5-2) were in action. Sanders submitted Vince McGuiness (5-8) with just seconds remaining in the first round while Lacey lost a unanimous decision to Da’Mon Blackshear (5-1) in the main event. 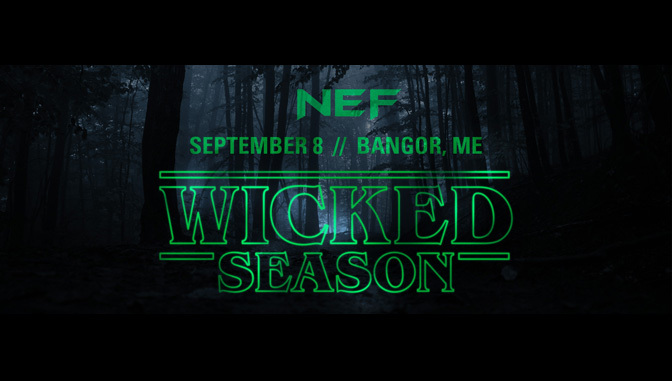 NEF’s next mixed-martial-arts event, “NEF 35: Wicked Season,” will see the company make its return to the Cross Insurance Center in Bangor, Maine. The event is scheduled to take place Saturday, September 8, 2018 with a bell time of 7 pm. The ticket pre-sale is happening now online at www.CrossInsuranceCenter.com with pre-sale code NEF. Tickets will go on sale to the general public this Monday morning, June 18 at 10:00 am EDT.